One of the main pillars for good practice in voluntary organisations is the issue of good financial management, with a focus on trnasperancy and accountability. 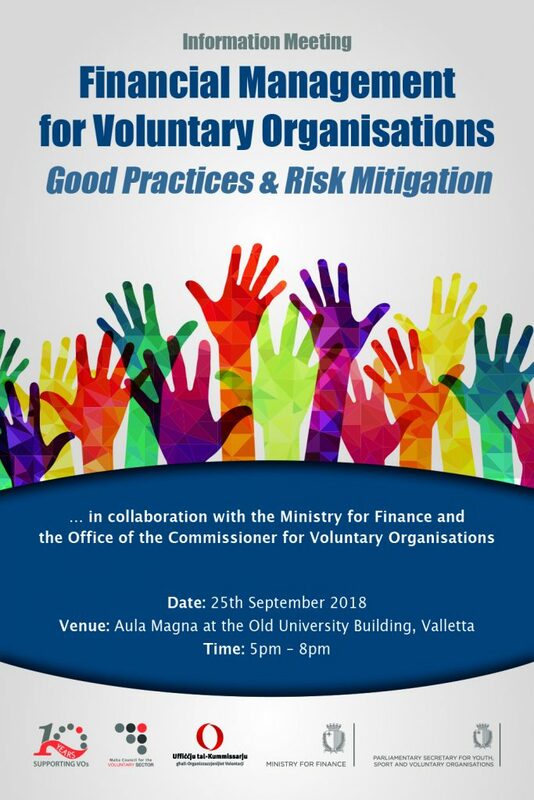 To sustain the importance of this issue the Malta Council for the Voluntary Sector in Collaboration with the Commissioner for VOs, the Ministry for Education and Employment and the Ministry for Finance organised a seminar at the Old University in Valletta on the 25th September 2018 entitled ‘Good Practices and Risk Mitigation’. In his opening address Hon. Prof. Edward Scicluna, Minister of Finance, stressed on the importance that all institutions must work operate within the protocols of good financial practices. Their operation does not only reflect on the same voluntary sector but also on the credibility of Malta at large, where all financial operators are continuously under scrutiny by European and International bodies. Mr. Alfred Camilleri, Chairperson, National Coordination Committee on Combating Money Laundering and Funding Terrorism and Parliamentary Secretary in the Ministry for Finance in his address focused on the three pilars of good financial practice, namely clarity, transparency and accountability. He said that only with these in mind can the voluntary sector keep operating and guaranteeing the financial commitment of both the autorities as well as the general public. Following these two addresses were three technical presentations by Ms Ruth Aisthorpe Gauci, Financial Analysis Manager, on ‘Risks faced by Voluntary Organisations’,; by Dr. Maria Criminale, Senior Legal Officer, Ministry for Education and Employment, on the ‘Amendments in the Voluntary Organisations Act’; and by Mr. Roderick Agius, Investigation and Monitoring Officer, Office of the Commissioner for Voluntary Organisations, on ‘How Voluntary Organisations should protect themselves against abuse’. Dr. Anthony Abela Medici, Commissioner for Voluntary Organisations, addresed the seminar with a focus on Compliance of Voluntary Organisations with his office, emphasising on the fact that with the new amendments to the VO Act which will come into force in the coming weeks he will be better placed to investigate and take the necessary steps against defaulting VOs thus guaranteeing better the issue of accountability and transperancy in the best interest of the same sector. He stressed the fact that VOs need to see to it that their position with his office is regularised so that they may keep their enrolment. The seminar was brought to a close by the address of the Hon. Evarist Bartolo, Minister for Education and Employment, who thanked the voluntary orgaisations for their sterling work in the community and stressed on the fact that he appreciates the work being done and understands that the issues of financial management puts an extra burden on the same organisations yet he said that this is a necessaty in today’s reality. The seminar was moderated by Mr. Mauro Pace Parascandalo, Executive Director of the Malta Council for the Voluntary Sector.